You’ve kept your temper all day against the onslaught of his. You’ve given grace and he’s yelled that he’s running away and started off down the block with face red and furious. You’ve chased after, you’ve told him people don’t leave this family, you’ve loved and patiently intervened one hundred different times when he’s been angry in one hundred different ways that his little sister is sucking up the time and attention he wants, needs, demands. You’ve given him the right color cereal bowl, you’ve helped her put her shoes on, you’ve cleaned the dishes and packed the snacks. You and your man have juggled whining and zipping coats and finding socks; who cares if they match or not – everyone finally has shoes on. You’ve done it right, you’ve been reasonable in the face of irrational toddlerhood and you’ve bent low to meet the needs of three tiny humans straining against their own limitations. You’ve reminded yourself you’re the grown up and you’ve tried real hard to act like it. Some days you get it right, right up to the finish line. And then he flings his tooth brush, he dunks his head in the bath water while wrapped in a towel. He refuses to quit asking for that one last snack and it’s easy – it’s easy to let the temper pour out of you like a hot rush of lava and it can feel so good. Clenched fists and jaw and gut, you have a bad moment easily as irrational as his. Then you take a deep breath. You sit down on the sofa. Your husband tells you you’re doing OK. And it’s hard – it’s hard not to let the wind of the day get knocked clean out of you. 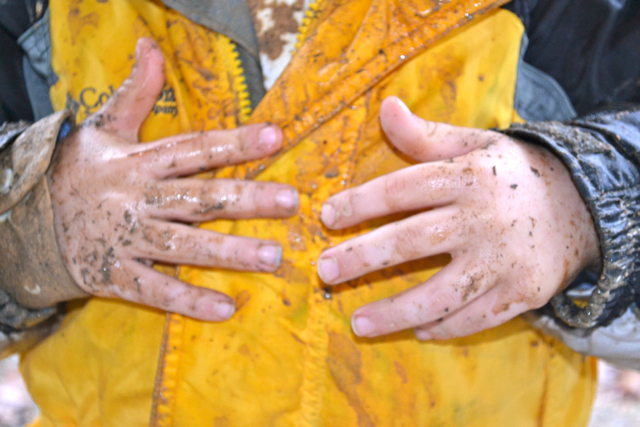 It’s hard not to wash your hands of it all and listen to the voice that tells you you’re no good at this. The voice that whispers you’re a disaster of a mother. The voice so familiar it sounds almost like your own. The voice that’s always there when the dinner doesn’t turn out right, when you forget to sign the field trip form, when you’re days behind on their math homework, when the dog jumps the neighbor’s fence. Again. That voice that alternately laughs like a manic jackal at the long list of everything you get wrong or whispers into your soul that you’re no good at this. No good, again. 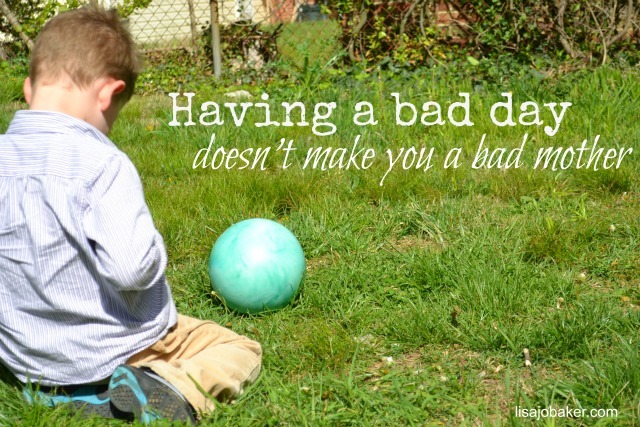 The voice that thinks bad days make bad mothers. Maybe you’re too tired right now to recognize it, maybe you’re too overwhelmed by a new week, maybe those dishes from last night with the pasta still stuck in little chunks make it hard for you to see anything that isn’t in the line of sight of the sink, so let me say it for you. Let me remind you, friend, that voice is a liar and a cheat. It will rob you of the rest of the day, it will hack away at the good parts, it will spit on the beautiful moments that happened right there in the minivan in between meltdowns. Those magical, parenthetical moments when everyone is laughing and the world is full of the glory of new beginnings and they look like a seven, five and nearly two year old. Buy ear plugs if you have to – turn up the music, dance in the fact that you are doing it – you are mothering and it’s the hardest gig for the most demanding audience. Don’t waste the good moments on that voice. Don’t listen. Learn to tune it out and run to your kids instead. Run and hug and laugh away the bad moments. Say sorry when you need to and stay down on your knees a little longer, look around and see how the world is small and big at the same time and it’s right there in your hands. You haven’t dropped the ball – you’ve just had a bad day. Get up friend. Keep getting up. This is how we learn to walk. By falling down a lot and then getting right back on up. Because sometimes the best way to help our kids is to encourage their mothers, so this. This is my Monday reminder. To you. To me. To us. Over and over, I find the encouragement here that I need. You echo my thoughts and I am glad. I leave here realizing that I can do this and I am not the only mom who sometimes struggles. Thank you. Oh, those parenthetical moments make it all worthwhile some days, if only we don’t miss them while we’re still steaming over the mess that came before. My girls are 11 and 8, and I struggle to keep from defining myself by those less than stellar days. Thanks for this timely encouragement! Thank you for this reminder! I so needed to hear this today…I just had to take a minute to sit down and chill with a cup of coffee (which has turned cool since it seems we never get to actually drink it when we pour it from the pot!) and here waiting in my inbox was this message. Thanks!!!!! I just started getting your emails and every time you always make me feel better about things!!!! Thank you for taking the time to remind all us mothers that we all have struggles and that we are not here in it alone!!!!! Great to know I’m not the only one. Apparently we’ve been facing the same thing, Lisa, I wrote about it at http://blog.mom4life.com/investing-volcano-eruption-insurance/ as a guest blogger. Thanks again for posting this, truely, it speaks to the heart! Thanks for this very timely encouragement! We had a bomb of a birthday party here yesterday and I was feeling a little low due to my negative responses to the disappointed and emotional birthday boy. You have a gift….thanks for sharing! Yes, oh yes, Lisa -Jo, how did you know I needed this grace today? Thank you. You always cheer the loudest for your mom-friends. Love you. I so remember those days as if they were yesterday instead of over 25 years ago. My own are grown and are in the middle of this muddle called parenthood themselves now. I hear echoes of my own heart in their voices as they describe their days with the grands. I’d like to add my encouragement to yours- This, too, will pass. It may not be painless, it will not be without work, but it will reap a harvest when the time comes. Stand firm. Listen to the Holy Spirit’s voice and reject the accuser’s-he gets it wrong every time! This does not change as they get older. The 24 year old makes a snarky comment about your parenting skills. The 20 year old expects you to drop everything because he waited until the last minute and you’re a [! @#$] because you can’t. The 18 year old judges your every move while you invoke the mother’s curse in your head. Oh those frantic days, I remember them well. I know it sounds funny to say this, but enjoy them, because sometimes the quiet of no children in the house is just as emotional. Lisa Jo, thank you for this. Coming off of a week of sick/snotty/whiny/sleepless/clingy daughter I needed the reminder that I’m still doing ok at this motherhood thing. Even when I ended up in tears last night after getting hit in the face AGAIN by my not-so-gentle toddler and hubs kindly suggested I take a time out in my closet….I’m still doing ok. I’m still who God chose for my little girl’s mama. Thank you. Thank you for those words. Needed just for me, just for this moment. Ahhh the “voices!” I just wrote about those voices (in a post about things that help me to push through struggles); now everywhere I go I see others writing about them as well. It’s refreshing, really. Thank! :) And yes – You are still a good mom, despite what the voices say! Thank you for such a poignant reminder, so well written. We arent even at the toddler years, but i already can hear that voice on bad days, so thank you! How did you know this is what I needed to hear today? And that this is exactly where I’m at today? I’m glad God has placed you in my life!! You are such an encouragement to me every time I visit. Your honesty is so refreshing. So great to hear this again. You illustrate the scene so beautifully. When I am feeling this way, I remind myself that my job is not to be the perfect mom, but a good-enough mom. I think I read about it Parents magazine or something a few years ago and it stuck with me. If kids had a perfect mom, they would never learn to deal with less than perfect situations or people. So really, the perfect thing you can be for your child is a good-enough one. One that tries and fails and tried again. Thanks for the post. Such a great post, Lisa. I remember these days with toddlers, and I know so many moms going through it right now. Sharing with them. Thank you for writing this encouragement for us, today, Lisa-Jo. My heart just breathed a nice big sigh of understanding. And relief. If ever there was a day I needed this, it was today. Thank you. Thank you. I’ve been that discouraged overwhelmed mother for the last few weeks… severe morning sickness and 3 toddlers, 4 and under, nothing gets done! Piles of dishes, piles of laundry, filthy house.. it has all combined to nearly bring me to depression! Thanks for the encouragement. Bravo, Lisa-Jo! Well said! Thank you. Lisa Jo – these are great words for mama’s of all ages. And also great words for anyone who is human :) thanks for the reminder to not dwell or predict or react based on any particular moment. His mercies are new every morning. thank you Jesus! You have such a gift. Such a gift with words–words that go right to the core of tired, struggling mommies in the heat of battle. My children are bigger now… 15,13 and 10… but those days you’re talking about are still so fresh in my mind. I think those years– those wonder years– shape as at the core. They are never far from my memory. It is easier now… in a way. But every bit as precious and fleeting. Thank you for being such an amazing advocate for this under-song, universe-altering job that mommies work on every day. It’s so worth it… thanks for reminding us. How do you always manage to put into words my life at exactly the right moment? Oh, I so melted yesterday because I couldn’t. do. it. anymore. But I got some sleep and today was a family day and I read this post and I’m banishing that voice that is too loud too often to the far away for tomorrow. Because even if I have a bad day, it’s because I’m still a good mom and I’m probably trying too hard to be perfect. Thank you! Lisa-Jo, I just needed to say thank you and let you know that God is using your words a lot in my life right now. I’ve been coming out of the valley of post-natal depression and, whilst things are pretty good now, there are still some days I look in the mirror and wonder what on earth I’m doing. Thank you for the encouragement. Keep up the great work. I feel like a horrible mother this past week or so. After 5 weeks at home with 1 to go, school can not return fast enough! My nerves are no longer frazzled they’re singed…I’m not proud of the way I’ve dealt with my AS son who needs understanding but I’m plain all out of that…Thank you for your gentle reminder to keep at it, to keep forgiving, to keep looking up. Victory in Jesus!! right up to the finish line… yes! i know that very thing! and then i kick myself that my patience didn’t last. thanks for the encouragement to keep on going. Beautiful encouraging post! Thank you for writing such true daily life descriptions of life with lil young ones. Every mom should read this! Thank you! My 2 youngest children are 6 and 8 and have been at it ALL day. I tried to take them out for some exercise to a trampolining place only for my eldest to have a young man land on her foot and for her now to be wearing a boot for the next 2 weeks. Yes, I’ve felt that I am a bad mother today. You know what’s worse – I am a parenting educator and coach. People come to me to ask what to do with their children but I don’t know what to do with my own!! Agh. But you are right. I’ve only had a bad day. Tomorrow is a fresh one. Let us live it to its full and not be burdened by the weight of yesterday. Again, you speak straight to my heart and to my soul. Thank you. Thanks so much for being the cheerleader. Wonderfully written. An absolute gem of encouragement. I thank you, as I often do when I comment after reading your posts. I’m printing this post and taping it to my bedroom mirror (which is where I go when I need a time-out). This is my reminder that I’m doing OK. Thank you. Just thank you. Wow…thank you Lisa-Jo. I will retread this post and share with my friends. What a huge blessing in your words! Oh girl, you made me cry with this one! I hear these voices all too often. Once I told my husband some of what the voices were saying in my head, and he was horrified that I would think such terrible things about myself… that made me feel a little bit better, lol! I’m trying to remember, when I’m in the thick of it and hanging on to my last remaining shreds of patience by my fingernails, to tell myself the truth. Instead of thinking how awful my kids are and how hard my day has been and what a horrible person I am for thinking these things, I’m trying to remember to tell myself (out loud works even better!) I AM a good mother, I love my children, they’re not doing …… just to aggravate me, God loves me, and He is right here with me… and whatever other bits of truth I can come up with in my frazzled state. And it really helps! Thank you for being honest and real and pouring grace on all of us out here in the trenches, you are a blessing. Your words are so true and encouraging. What a beautiful picture of how we are not perfect but we are blessed by motherhood. I love your motivations to tune out the voice which lies to us that we are rubbish and we can’t do it. We all listen to that voice sometimes and all it achieves is to make us feel wretched. I love your writing Lisa-Jo and you are a blessing to many as you tell the truth and talk about the real stuff that we all face. Blessings to you. Thank you Lisa-Jo. God spoke to me through your words and they reminded me to listen for the voice that speaks truth and love, not lies and discouragement, even when my 2 year old will only eat cereal bars:). I’ve been reading your blog for a while and your words have touched a part of me that I didn’t know existed-the part that has learned that mothering is a way to grow closer to God. You are a blessing. Thank you for being faithful to your calling. These words have spoken to a heavy and discouraged heart. My thoughts are lighter and can sense hope. Thank you. I have a lot of bad days. I need to cling to this and to be more mindful of the positive moments. i am browsing this site dailly and obtain nice information from here daily.